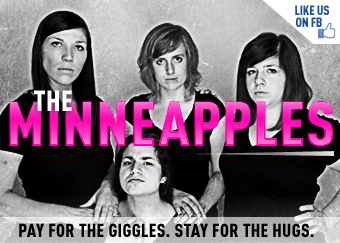 The Minneapples are a group of lady improvisers doing ladylike lady-prov for audiences that like all things lady. Hannah Wydeven, Madde Gibba, Meg Linafelter, and Taj Ruler have joined comedic forces to bring The Minneapples to shows all over the Twin Cities like Improv-a-go-go at the Brave New Workshop, Sample Night Live at the History Theater, and their very own weekly show at Huge Theater! They tell their mothers that they hope to find suitable husbands doing lady-prov (this is not true).